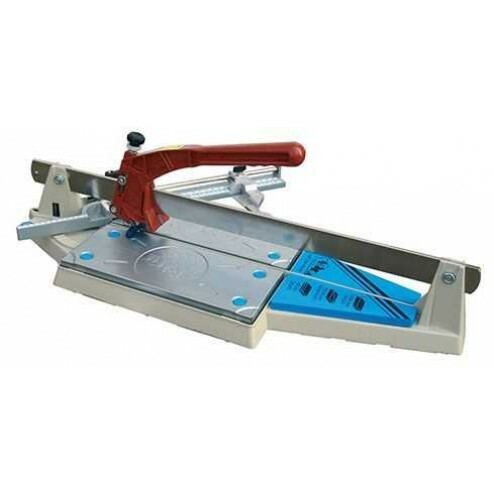 Professional, accurate, strong cutter with automatic breaking pad.The pads drop when the handle is raised and flips up when scoring.Adjustment available for thicker tile up to 1' (25 mm)A sliding stop that flips up out of the way to make additional cuts without losing previous measurements.Spring loaded table and foam extensions pads provide alternate breaking methods and the proper amount of impact absorption to reduce broken tile. Light cast aluminum board with steel rail and rollers providing superior strength with low maintenance. Scratch-resistant breaking foot does not mar delicate glass.